Some people are surprised when Czechs talk themselves down as a nation – why we're not more proud of ourselves. Well, let me tell you something, there are pretty good reasons for that. Our prime minister in resignation (that's the official title that he acquired when he had to resign after his government failed the confidence vote in the Parliament) Mr Andrej Babiš is currently prosecuted by the police for a $2 million subsidy fraud (billionaire Babiš stole the taxpayer money by pretending to be a rather poor chap with a travel agency) – which should, according to the police expectations, win him 10 years in prison. Today, another "public secret" was officially confirmed by the court. 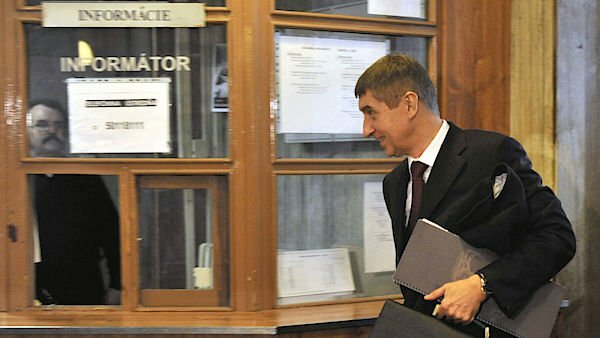 The regional court in the Slovak capital of Bratislava reviewed Babiš's lawsuit concerning his being a communist rat. Half a year ago, the Slovak constitutional court brought some bad news to Mr Babiš and redefined the conditions for such lawsuits by dissatisfied agents. First, testimonies by officers of the communist secret police were no longer permissible as the primary evidence because, shockingly, officers of communist secret police are neither maximally trustworthy nor sufficiently free to talk the truth. Second, it's not possible to sue the historical institute because it's not responsible for the validity of the historical evidence. So with these interventions by the supreme, Constitutional Court of Slovakia, the lawsuit returned down to the regional court in Bratislava. It was almost unavoidable that under the new rules, Babiš had to lose. And he did lose today. So there exists no legally relevant argument to question the historical records: Babiš has been a communist rat. Within the Slovak legal system, the verdict is final and can no longer be appealed. Babiš vows to "sue till the end of his life" and he would like to sue in the European courts and start another Slovak lawsuit against a different straw man, namely the Slovak ministry of interior (well, probably because the communist StB was belonging under the communist ministry of interior – are these two ministries of interior, the communist and democratic one, "the same subject"?). Whom should you sue if you don't like the history and the waterproof documents that show what the history was? Now, I've gone through the pages of his main folder number 25085 (Babiš appears in 8 different folders, however). He became an associate of the StB in 1980, was promoted to a full-blown informer two years later, and officially left StB in 1985 when he moved to Morocco as a communist director of a national company (Petrimex) for international trade. (But in StB, he survived a "purge" of 1984 when StB lowered the number of agents; and he had access to a conspiracy apartment.) That was the company he hijacked after the fall of communism, renamed to Agrofert (while getting rid of all the negative assets in the company), and he is both proud and lionized by for that clever act by millions of low-IQ Czechs. The documents look very clear. He was an agent of StB. He signed the agreement with being promoted to an agent in a well-known wine bar (Near the Shoemaker) at a well-known moment 11/11/1982, was initially "mined" to provide sad responses to the death of Comrade Brezhnev on the previous day but agreed to cooperate in a full spectrum of activities, and tons of such things are known. This is a broader topic that is discussed in the context of many other agents. About 150,000 people – one percent of the Czechoslovak population as of 1989 – have been included in the database of agents and informers and collaborators of StB throughout the decades. So it was a very selective company (1%), much more selective than the members of the communist party (10% of the population). StB agents were a true reverse elite of the nation. These were rats that were crippling the lives of hundreds of thousands of other people. They were collecting or inventing and transferring the information about people whose political backgrounds or attitudes were inconvenient for the totalitarian regime. Such inconvenient people were consequently fired from all good jobs, their kids were expelled from all good schools, some of them were jailed (and yes, even relatively recently, e.g. beating and torture by electric current). Many people in this list of 150,000 associates of StB have claimed that "they were innocent". Some of them "haven't even known" that they had anything to do with StB. The folders were prepared by the communists to "destroy their image" and stuff like that. Please, give me a break. I have never believed such stories for a minute. I remember the epoch rather well. People who were connected to the secret police were considered "elite" of the regime, doing some potentially dangerous, but responsible but important activity. We, the kids, were taught about StB, an important body in the socialist system, during the Civic Education brainwashing classes. (The other part of the Ensemble of National Safety was Public Security, VB, later renamed to the ordinary overt Police of the Czech Republic.) Before the communism fell, no one would be included into those databases as a punishment because it was really considered honor by those who held the power. They wouldn't do this honor to their enemies. So of course Babiš knowingly signed the cooperation and worked for them. His nice job in Morocco was probably at least partly won for this extra "special" service he did for the regime. The available documents don't make it clear what he has exactly done over the five years when he was officially affiliated with StB. Many of these things weren't even officially written anywhere. (We can read sentences like "Babiš fully understands the need to fight the enemy" in his main folder.) But I tend to think it had to be bad. It's possible that he was "only" reporting people doing something against the "socialist ownership" by the whole working people – the same kind of stuff he was obsessed with even in recent years (bureaucratic terror against all businessmen and self-employed people except for himself). But even if it were "just" ruining the people who traded foreign currencies or people who were self-employed (which wasn't legal) or, more historically, going after the neck of exporters who were OK with low prices, now I think it would have been a good enough reason for him to be hanged at the end of 1989. We chose to execute nobody at all – it was the Velvet Revolution and idealist teenagers such as myself genuinely believed it was the right method to deal with the history and the scum that had secured that history and no bad consequences would arise from this generosity of ours. Well, generosity may have consequences. Of course we explicitly debated the scenario that in a few years or decades, an agent of the communist police would take over the country. But we largely dismissed such ideas as plots from cheap science-fiction movies. Even if one considers his stories before 1989 irrelevant, there's one directly relevant point: He's been lying about his past throughout his life. He may be somewhat talented for some things – not everyone would be capable of becoming a billionaire, even with these great starting conditions. He has a natural charisma of a village idiot and can communicate in a way that is appealing, especially to the most ordinary people whom he resembles – he also speaks French and English well enough, partly because he was able to study in Switzerland as a member of an exemplary communist family with the unquestionable working class credentials. But from any moral viewpoint, he is clearly filth. It's not a problem at all for 1.5 million of his voters. And there are lots of voters of other parties that are actually big enough fans of Babiš himself, too. The Yes/No question about Babiš would end with a 50-50 result, details of the question would matter. By the brute numbers, the very statement that it's bad to have been a communist rat has incredibly become controversial in our nation. In this particular respect, we have already returned before 1989 again. Needless to say, Slovak commenters e.g. at Sme.sk are rightfully mocking our nation, their older brothers, for those things. Many things are analogous in the two nations – and others – but I think that Czechs are the only central European nation that can lionize a former communist rat. In Ukraine, you could get similar crappy oligarchs elected but if you wanted another country which elevates this garbage, you would have to go deeply into Central Asia – and I don't even want to insult any country in Central Asia because I don't actually know for certain whether the moral standards are this bad in any of the countries over there. In the secret police jargon, Babiš's codename was Bureš – which is a similar surname that is much more widespread in Czechia than Babiš. So Babiš's political opponents have called him, semi-jokingly, Bureš for years. Now it's legally 100% unassailable to call him Bureš again. But I am convinced that according to the laws and the constitution, it has always been perfectly fine to describe him as the communist rat Bureš. The Slovak courts that issued the partial verdicts that his "StB folder was unjust" were just verdicts of courts that decide what the police and other law enforcement forces consider as the basis of their action. So if there's a law that prevents agents from being ministers (we effectively abolished this "lustration bill" for ministers, sadly, in 2014 or so; you still couldn't be a boss in a small town's post office with the StB past but to be the prime minister is just fine LOL), the "unjust" verdict means that he will be treated as a non-agent. But the verdict couldn't have changed the citizens' opinions about the truth; and it couldn't have stripped the citizens from their freedom of speech and thought. I am sure that throughout the years, all sensible people must have known – and were totally free and encouraged to say – that Babiš clearly was an agent of the communist secret police and the "unjust" verdict was just a prank with some technical consequences that doesn't have to be taken seriously by any regular citizens or pundits. Concerning the Czech nation's support for similar men, it's much worse than how I described it. Not only President Zeman says that the official collaboration of the newly appointed PM (by Zeman) Babiš with StB is "not a problem" for him. Babiš isn't just "barely getting" enough political support to get away with his being a former communist rat or subsidy fraudster and similar things. Those millions of voters must consider all these things amazing advantages and they think he's miles above competing politicians. And some people suggest that his political support will even grow – and I am afraid that however satirical these comments are meant to be, they will turn out to be true. Of course I know some "doughnuts" like that – his fans are called doughnuts because Babiš has often handed out doughnuts in subway stations to win additional votes of morons. It seems truly impossible to rationally discuss with them the question whether Babiš is really an appropriate guy for a prime minister of a central European country. Thank God, this hopeless idiocy of theirs is somewhat limited in impact, just like many religious beliefs. So it's sometimes totally possible to discuss other issues with them – and with Babiš. But concerning Babiš and related morality issues, it's hopeless. And it's not just about some obsession they have with this village idiot. It's about more general questions, too. For example, I mocked them for being bribed by a doughnut. But based on my conversations, it seems that most of them think that it's great if not a moral duty to be bribed – by a doughnut or anything else. They will basically tell you – you are filth if you don't worship Babiš because he gave doughnuts to somebody. They seem to be easy to be bribed as well and proud about the ease with which you may buy them. Many of their views on morality are literally reversed images of what I consider ethical. P.S. : For the first time, I see that 8 very close family members and/or officials in Babiš's company have cooperated with StB, too. Just imagine how incredible the concentration is. Only 1% of the population cooperated with StB but in Babiš's environment, the percentage is some 50%. One more thing: In a shocking February 8th interview with the public TV, Babiš says that he doesn't care at all whether his government enjoys the confidence of the Parliament because he's working hard. Wow.